It's been a very hectic six weeks for me, and with the incoming holidays, I'm not seeing signs of a slowdown any time soon. That said, I have a backlist of reviews that I'm hoping to get to beginning next week, and finishing through January. 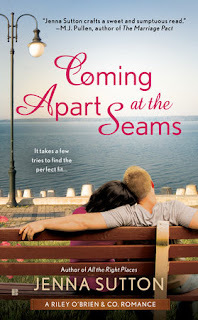 Now, with that out of the way, today I am delighted to be hosting a tour stop for the wonderful Coming Apart at the Seams, the second book in Jenna Sutton's Riley O'Brien & Co series. Released by Berkley on December 1st, this book takes us back to the O'Brien family, this time to address Teagan's love life (or lack thereof). Coming Apart at the Seams is available now! When I started reading Coming Apart at the Seams, I had mixed feelings about it. I loved Jenna Sutton's first book, All the Right Places, and so this book had to live up to some hefty expectations. Additionally, Teagan was, well, a jerk in the first book. So I was predisposed to *not* liking her. 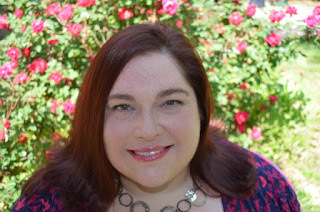 But for me, there were some additional issues--things that i personally don't usually love in romance novels. In fact, when I started reading, it seemed to me that this book had gone out of its way to use elements that I don't usually love. The first section of the book is the past framed by the present, so that we can learn the backstory between Teagan and Nick before finding out how things unfold between them in the present. I'm not a huge fan of this type of narrative. I'm also not a huge fan of second chance at love stories. Often, I find them too painful, or poorly balanced, or without enough opportunity to atone for/forgive past mistakes or address those issues that made things go wrong the first time. There are some other choices in terms of character and plot that I won't talk about because I don't want to spoil anything, but they also had me, initially, questioning where this series had gone so wrong. But somehow, I ended up loving this book. I don't know if Sutton worked magic to have all these personal-red-flag elements come together or what, but somehow, they did. I loved Coming Apart at the Seams despite being fully prepared, after the first couple chapters, to hate it. Teagan and Nick worked for me. I could feel the chemistry. I could understand how their signals had gotten so badly crossed the first time around. I loved that they had this history between them before they hooked up the first time. Teagan's bad choices in the All the Right Places were maybe not made entirely forgivable in this book, but certainly they were infinitely more understandable. I could empathize with her a lot more once I'd read her story. I adored Nick. How hard he tried, how much he appreciated the people who were truly in his life, how much he wants to repair his relationship with Teagan. I wanted to give him a big hug a few times. In the end, everything came together beautifully. My only actual complaint is that there wasn't a longer moment at the end to cap out an important conversation between Nick and Teagan. I just wanted a few more beats to be fully satisfied about a specific issue they had to address. If you have any apprehensions about reading Coming Apart at the Seams, shed them! I loved this book, and I look forward to seeing what else Sutton and the Riley O'Brien & Co. denim empire have in store for us!